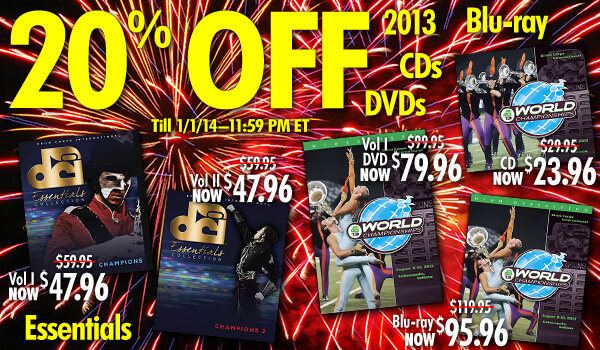 Count down the days to the New Year with great after-Christmas savings at DCIstore.org! Through Wednesday, Jan. 1, you can save on select titles from Drum Corps International's extensive audio/video collection. A four-disc set featuring the top 25 corps as they performed last August at Lucas Oil Stadium. 13 of the most-loved DCI World Championship-winning performances of all time featuring completely re-mastered audio and video up-converted to high definition Blu-ray disc. 13 more classic World Championship performances with re-mastered audio and video up-converted to high definition Blu-ray disc. Promotion begins Thursday, Dec. 26, 2013 and ends Wednesday, Jan. 1, 2013 at 11:59 p.m. ET. DCI reserves the right to modify or cancel promotion at any time.